Shadow Noises (Lazar Kapsarov) from Macedonia is a darkpsy and forest project based in Gevgelija. After his first track was successfully released on Banyan Records he is back with three new deep tracks from the depths of the dark, hidden world. Here you will find scary atmosphers and noises which will lead you to his mystic world where all your memories will be brought back to the forefront of your reallity. We honestly hope you will enjoy this journey. Mastering and cover artwork made by Blisargon Demogorgon at Bhooteshwara Records’ studio. MP3 Download | FLAC Download | WAV Download · Download count: 7,047. The bass in this has an obvious and simply engulfing presence. The best forest out there is meant to take you on a journey through psychedelic sounds and overwhelming textures. This does just that. Wearing headphones for a true experience is recommended throughout this dark release. 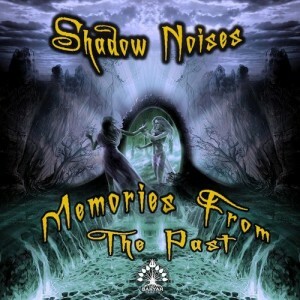 Similar to other well-done forest releases, Shadow Noises – Memories From The Past expresses three different solid and progressive tracks, each with a perfectly crafted series of pops, arps, waves, synths, and seemingly random yet organized sounds. There are many different layers, all stacking on top of each other to sound simply orgasmic. Wonderful, clear bass mixed with an evolving, pad-generated soundscape comes straight out of dark styles we all love and enjoy. I personally find it to be a wonderful addition to anyones forest collection. Play it on dance floors. Relax in your room. Do whatever you want, but at least give this short album a listen. It is very well mastered and contains excellent development. Dark and juicy. Progressive and Psychedelic. Well crafted. Oh, and “The Wraith of Gabriel” is GREAT. Congrats to Shadow Noises and Banyan records for this great release!!! It was a pleasure to be part of it with mastering and cover design, keep them coming!!! glad that our neighbours from FYROM produce great psy…we need to make a balkan event that takes us altogether! la única opción alternativa es la demanda judicial de nulidad de la cláusula suelo.